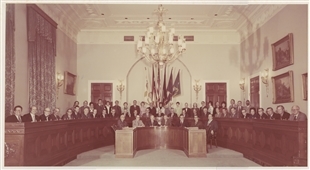 The members and staff of the Interior and Insular Affairs Committee met for a formal photograph in 1970. 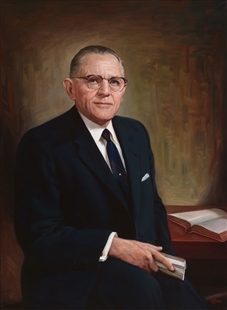 Chairman Wayne Aspinall sat at the center of the dais in the hearing room used by the committee since the 1940s. Just visible on the side walls are paintings of Native American life commissioned for the Indian Affairs committee in the 1860s.